Semistra seems to be the name of the first settlement of people on the Golden Horn some time during the first millennium B.C. This was at the head of the Horn where the two streams, Cydaris (Ali Bey Suyu) and Barbysus (Kâğıthane Suyu), come together. In the ninth century B.C. the town of Lygus began on the headland of the cape now known as the Seraglio Point. Byzantium, according to legend, was founded by Byzans according to instructions from the Oracle of Delphi for him to build “opposite those who were blind”. That seemed strange until the settlers Interpreted the people of Chalcedon (Kadıköy) as being blind for having occupied that bay rather than the more favorable point on the European side of the Bosphorus. Byzantium was an important center of trade, and about 279 B.C. began to exact a toll from all who used the Bosphorus. Many different armies attacked it, those of Darius, Philip of Macedon, and Septimus Severus among them. It is not mentioned In the New Testament, although the First Letter of Peter is addressed “to those of God’s scattered people who lodge for a while in Pontus, Galatia, Cappadocia, Asia, and Bithynia” (I Peter 1:1-2) — a quite general scattering it must be admitted. Beyond this there is an early Byzantine tradition which names St. Andrew, brother of Simon Peter and one of the twelve apostles, as the “first called” to this area and associates him with the claim that the See of Byzantium was apostolic in origin. Byzantium became the capital of the Roman Empire under Constantine in 330 A.D. when he formally took up residence in the city. He had recognized Christianity In 313; it remained for Theodosius I in 391 and 393 to establish the new religion firmly as that of the state by forbidding the observance of all pagan rites, both in public and in private. New Rome as it was first known, or Constantinople, continued as the capital of the Byzantine Empire until its conquest in 1453 by the Ottoman army under Sultan Mehmet II. The most famous church of Eastern Christianity was built in Constantinople by the Emperor Justinian between 532 and 537. Awed by this triumph, he is quoted as exulting when the church was dedicated, “Glory be to God, who hath deemed me worthy to accomplish such a work! Oh, Solomon, I have surpassed thee!” Solomon’s temple is only a memory, but Hagia Sophia continues to awe architect, church historian, and casual tourist alike. In the Museums of Antiquities (Arkeoloji Müzeleri) near St. Sophia, in addition to the sarcophagus reputed to be that of Alexander the Great, are three smaller pieces of some interest and importance to biblical scholars. One is a small, irregular stone with what appears to be a child’s lesson on seasons cut into it. This “Gezer calendar” has been dated tenth century B.C. and is the oldest extant bit of Hebrew writing. The second is the stone from the temple in Jerusalem which defined the boundary of the Holy of Holies, the point beyond which a Gentile was to enter only on pain of death. The inscription is in Greek so that there could be no plea of misunderstanding by one who trespassed. The third stone is known as the Siloam inscription. This is the inscription in Hebrew from the Hezekiah tunnel between the Pool of Siloam and the Spring Gihon in Jerusalem (II Chronicles 32:30). All three pieces are in an area of the museum often closed to the general public. Istanbul is rich with a thousand other details of our history, but the description of them lies outside the province of this page. 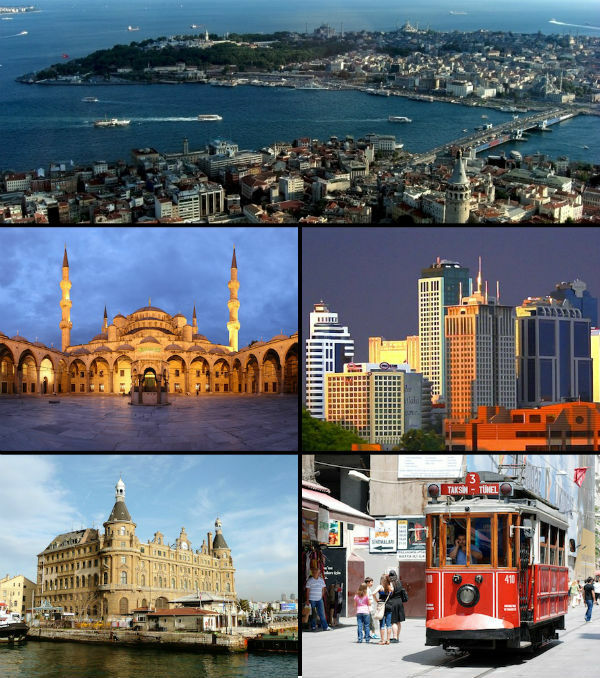 Clockwise from top: The Golden Horn between Galata and the Seraglio Point; Maslak financial district; İstiklal Avenue; Haydarpaşa Terminal; and Blue Mosque. The remnants of the Great Wall are very impressive. They soar above the small valley and give you a sense of the role they played in the defence of Constantinople.